Perfect for your favorite CBB editor. Now that Halloween is over, it’s now time to start thinking about “The Holidays.” Dogfish Head Craft Brewery is already in the spirit and has announced the release of an Xmas collection of off-centered ales — IPAs for the Holidays variety 12-pack. Featuring an assortment of India Pale Ale goodness, IPAs for the Holidays includes the return of a fan-favorite, continually hopped IPA, a beautifully balanced imperial pale ale, a dry-hopped, dark malted ale and an exclusive beer-wine hybrid that’s a blend of 60 Minute IPA and Syrah. While diverse in bitterness and body, the IPAs for the Holidays 12-pack unifies with vibrant aromas and intense hop flavors that emphasize Dogfish Head’s commitment to continual hopping innovation, creativity and experimentation in brewing, along with dedication to always using fresh culinary ingredients in their beers. Sixty One — 12-pack EXCLUSIVE! A marriage of two Dogfish Head innovations: beer-wine hybrids and continually hopped IPAs. 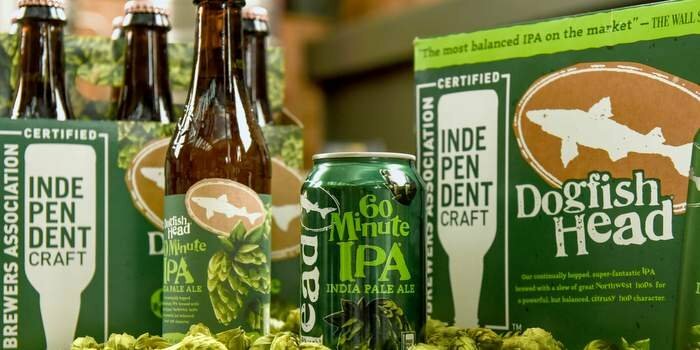 Dogfish took its best-selling 60 Minute and added Syrah grape must to create an IPA with equal parts fruity complexity and pungent hoppiness. A continually hopped super-fantastic East Coast IPA brewed with a slew of great Northwest hops for a powerful but balanced, citrusy hop character. A continually hopped Imperial IPA whose powerful malt backbone stands up to the extreme hopping rate for a pungent, not crushing flavor. A boisterous brown ale meets well-hopped IPA is brewed with aromatic dark malt, organic brown sugar and dry-hopped liberally for your holiday-drinking pleasure.